Protects operators from flying chips, coolant, and the rotating chuck. Guard hinges upwards, well out of the way for set-up. Gas strut raises guard and keeps in open position for set-up Guard is 12" wide. Included side lexan encloses the area around chuck / spindle, preventing reach in. Designed to fit an HLV headstock. Trim to fit. Constructed from industrial aluminum extrusion and 1/4" lexan Powder coated PPG's "OSHA Safety Orange" Mounts by drilling/ bolting to the coolant tray. The design is engineered to clear the various locations of objects such as coolant pump and power wires. The posts may be positioned anywhere to clear these. Will fit Hardinge HLV/HLV-H, HC chucker, DSM-59, DV-59, TL, TFB-H, and import copies such as Cyclematic & Sharp Note how the mounting can be reversed- see Photos. Lathe guard shown on a Clausing Colechester 15 x 48 lathe. 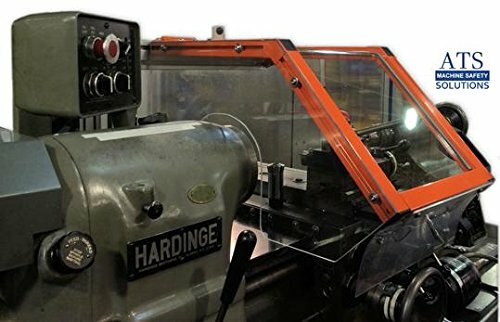 Hardinge Dovetail machines need to be installed like this to clear the motor behind headstock. If you have any questions about this product by ATS Machine Safety Solutions, contact us by completing and submitting the form below. If you are looking for a specif part number, please include it with your message.